Sun protection is a must for everybody regardless of age and ethnicity. However, a sun cream is no good if it merely sits unused in your bathroom cabinet because you don’t like the feeling of it on your skin. Therefore it can pay off to spend a little time to find a sun cream which feels great on your skin. Multiple brands have made sun creams especially formulated for the face and customized to different skin types, but if you think that they are little bit too pricey you might be more interested in sun creams for face and body. Here you get more ounces/milliliters for your money while the consistency of the product still is closer to that of “facial sun creams” than more traditional “body sun creams”, which often have a more greasy and emollient feel. It should be mentioned, nonetheless, that any sun cream can be used on any part of your skin no matter what it says on the label – it depends on what you find the most comfortable. The most important is that you actually use whichever sun cream you decide on in liberal amounts and remember to reapply it at least every two hours if you are continuously in the sun (on the beach, in your garden or in the park). Below we have made a list of the best sun creams for the face and body. If you are still curious about sun creams formulated specifically for the face, check out our list of those too. French Vichy (owned by L’Oreal Paris) offers a wide range of sun screen products in Europe, but a lot fewer in the States. Luckily one of them is the fragrance-free Vichy Capital Soleil SPF60 Soft Sheer Sun Screen Lotion which combines several UVA- and UVB filters to ensure reliable broad spectrum protection. One of the best things about this sun cream is how soft and weightless it feels on the skin; it almost has the texture of a “real” facial sun cream. This makes it a suitable choice for all skin types except those with oily skin in the facial area, who will probably find the Vichy sun cream to be too emollient for their skin. Vichy also has a SPF45 version of this sunscreen, but it does include fragrance unlike the Vichy SPF60 Sun Screen Lotion. 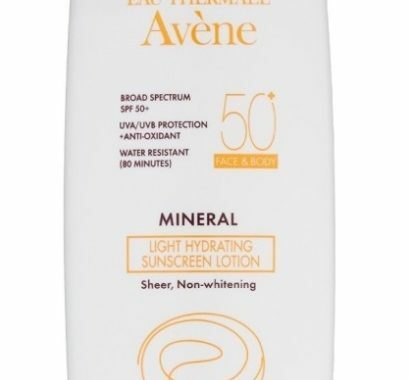 Avene makes plenty of good sun creams, but if you have rosacea, sensitive skin or simply just keen to use sun cream with only physical sun filters Avene Mineral Light Hydrating Sunscreen Lotion SPF50+ is the sun screen for you. The broad-spectrum sun protection is ensured by the mineral sun filters titanium dioxide (4%) and zinc oxide (6%), but Avene has also included the beneficial antioxidant vitamin E in the form of tocepheryl acetate. We choose this sun cream over EltaMD’s UV Pure SPF47 as the latter has a reputation for leaving a white cast on skin – which is indeed a nuisance with several sun creams that only use mineral/physical sun filters. Sun Filters: Titanium Dioxide (4%) • Zinc Oxide (6%). Paula’s Choice has a broad range of moisturizers with SPF for the face, but only one actual sun cream which is also water-resistant unlike the moisturizers – the Extra Care Non-Greasy Sunscreen SPF50. This sun cream has a smooth and matte finish on the skin as it is formulated especially for normal to oily/combination skin. 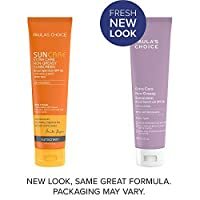 Paula’s Choice Suncare Extra Care Non-Greasy Sunscreen SPF50 is water-resistant up to 80 minutes as it includes several FDA-approved chemical/organic sun filters to ensure optimal broad-spectrum protection. It, however, also includes multiple antioxidants which are beneficial for helping your skin against sun damage, such as vitamin A, C and E.
Sun Filters: Homosalate 10% • Oxybenzone 6% • Octisalate 5% • Avobenzone 3% • Octocrylene 2%. 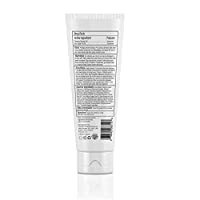 Other ingredients – Paula’s Choice Suncare Extra Care Non-Greasy Sunscreen SPF50:Water (Aqua) • Butylene Glycol (slip agent) • PEG-8 (thickeners) • Polyethylene (thickeners) • Silica (dry finish slip agent) • Dimethicone (silicone slip agent) • Picea Excelsa Wood Extract (anti-inflammatory agent) • Sodium Ascorbyl Phosphate (vitamin-based antioxidants) • Retinyl Palmitate (vitamin-based antioxidants) • Tocopherol (vitamin E/antioxidants) • Tocopheryl Acetate (vitamin E/antioxidants) • Titanium Dioxide (thickener/opacifying agent) • Aloe Barbadensis Leaf Juice (water-binding agent) • Bentonite (absorbent) • Methyl Glucose Sesquistearate (emulsifier) • Acrylates/C10-30 Alkyl Acrylate Crosspolymer (film-forming/waterproofing agents) • Sodium Polyacrylate (film-forming/waterproofing agents) • Kaolin (thickener/absorbent) • Ethylhexylglycerin (water-binding agent) • Disodium EDTA (chelating agent) • Sodium Hydroxide (pH adjuster) • Phenoxyethanol (preservatives) • Chlorphenesin (preservatives). Neutrogena has more than 10 different lines for sun protection where each line features several products with various formulas (stick, lotion, spray etc.) and with different SPF-ratings (usually from 30 and up). Among this abundance of options (which are not all equally good) we can wholeheartedly recommend the Neutrogena Ultra Sheer Dry-Touch Sun Screen SPF45 for normal to oily skin. It has a smooth non-greasy feel that should be suitable for even the oiliest skin. Neutrogena Ultra Sheer Dry-Touch Sun Screen SPF45 is water-resistant up to 80 minutes, but remember to reapply the sun cream after towel drying. The Jason skincare brand makes several good sun creams (except the Kids version, unfortunately), but only one which uses only physical sun filters in the form of titanium dioxide (2%) and zinc oxide (14.5%) – the Jason Mineral Sunscreen SPF30. Due to the many emollient plant oils such as shea butter, sunflower seed oil and jojoba seed oil, this sun cream is best for people with normal to dry skin. Jason Mineral Sunscreen SPF30 also contains various antioxidants such as extracts of chamomile, marigold and green tea. The only downside of this sun cream is that it is prone to leave a white cast on darker skin tones due to the very high content of zinc oxide. Sun Filters: Zinc Oxide 14.5% • Titanium Dioxide 2.0%. Posted in Skincare Reviews and tagged Avene, COMP, Jason, Neutrogena, skin care routine, SPF, sun cream, sun protection for body, sun protection for face, sunscreen, Vichy.